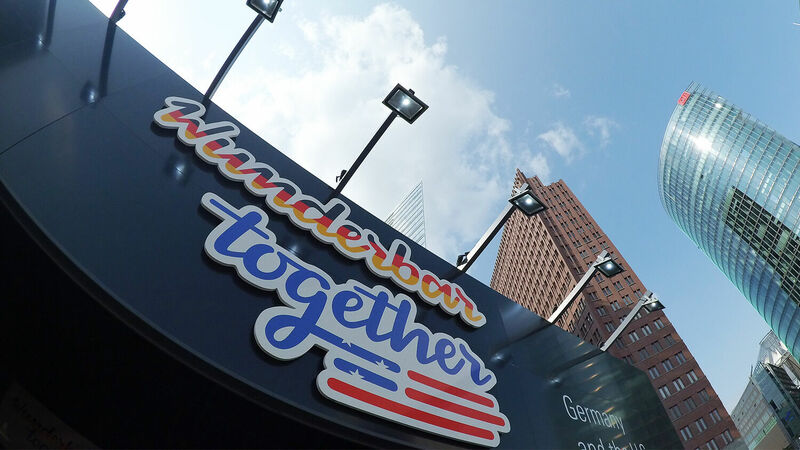 ‘Wunderbar together’ stands above the entrance to the Culture Tent on Potsdamer Platz. From October 2018 until the end of 2019, the United States is hosting 1,000 events to celebrate German-American friendship with the theme “Wunderbar Together.” The events are meant to highlight the “wonderful” ties that connect the two countries. Unfortunately, German-United States cooperation has become recent history; this year’s celebration of their alliance is a mere mirage. “The Year of German-American Friendship” is sponsored by Germany and “presents events and exhibits revolving around business and industry, politics, education, culture and science, to highlight the unique importance of trans-Atlantic relations,” according to the official website. In all these sectors, Germany and America have made astonishing progress in their cooperation since the end of World War ii. But the question remains whether this cooperation has led to a lasting friendship. In recent years, this friendship has come under enormous pressure that threatens to break all ties between the two nations. Thus Germany’s Foreign Office saw the need to reiterate its commitment to the alliance. “Germany is organizing a Year of Germany in the U.S.A., knowing that the United States and Germany are Wonderful Together—stronger than friends and partners,” Germany’s Foreign Office wrote concerning the events. “Our friendship with the United States means a lot to us, and we know that many people in America see it the same way. That’s why the people stand this year to focus on German-American friendship” (Trumpet translation throughout). But should America trust this cooperation? The two countries recently had major disputes over trade, military, economic and global climate change policies. In all these areas, the two have taken different paths and Germany has developed an increasingly hostile attitude toward America. Former German Foreign Minister Joschka Fischer told Spiegel Online that he believes the relationship has never been so bad. Germany’s former defense minister, Karl-Theodor zu Guttenberg, said that the relationship is worse than he has ever experienced. German Chancellor Angela Merkel has called on Europe to take matters into its own hands rather than trust the U.S.
Are these good grounds for close cooperation? Bible prophecy explicitly warns that Germany will betray America in this end time. My article “Is the U.S. Ignoring the Warning Signs From Germany?” highlights some of these prophecies along with corresponding events that have caused friction between the U.S. and Germany. Trumpet editor in chief Gerald Flurry fully explains this coming prophesied betrayal in his book Ezekiel: The End-Time Prophet. Under the subhead “German Double Cross,” Mr. Flurry points to verses in Ezekiel 23 that reveal how Germany will turn suddenly against America, at a time when the U.S. least expects it. Anyone who has kept up with the recent disputes between the U.S. and Germany can see that both countries are not working “wunderbar together” currently. While many are satisfied believing the illusion, few know that the Bible prophesies that today’s mirage will become tomorrow’s reality. The book of Isaiah reveals that after Germany’s end-time betrayal of America, God will intervene in world affairs and usher in a wonderful World Tomorrow, turning illusion into reality. This might sound fantastic and unbelievable, but as surely as the Bible prophesies the coming betrayal, it also prophesies this coming friendship. For “And the parched ground shall become a pool,” the Hebrew could read: “The mirage shall become a real lake.” We have seen the sun’s rays refracted on the glowing desert sands at midday. It gives the appearance of a lake. In the near future, those desert mirages will be replaced by real lakes! That mirage is only a type of the illusions that fill this world. Men see mirages in marriage, race relations, education, religion and peace endeavors—they see hope that later proves to be a dreadfully disappointing mirage! Soon all of those mirages will become reality—real successes and fulfillment. Today’s German-American friendship is one of those mirages. It looks beautiful and full of hope, but it is merely an illusion. Yet Bible prophecies show us a glimpse of what it will be like once this illusion becomes reality. “In that day shall there be a highway out of Egypt to Assyria, and the Assyrian shall come into Egypt, and the Egyptian into Assyria, and the Egyptians shall serve with the Assyrians. In that day shall Israel be the third with Egypt and with Assyria, even a blessing in the midst of the land: Whom the Lord of hosts shall bless, saying, Blessed be Egypt my people, and Assyria the work of my hands, and Israel mine inheritance” (Isaiah 19:23-25). As Herbert W. Armstrong explained in The United States and Britain in Prophecy, the modern descendants of Assyria are the Germans, and the modern descendants of ancient Israel include the United States and Britain. The Assyrians will assuredly bring their excellence and farsighted thinking in industry to help provide the large construction equipment needed in the new world for major topographical overhaul (Isaiah 41:15-16). They will use their famed musical prowess to compose and perform music that worships and praises the true God (Psalm 68:32). In Isaiah 19, God calls the Assyrians “the work of my hands.” God created the beautiful qualities that the Germans demonstrate today. But in Isaiah 10:5, God refers to the Assyrians as the rod of His anger and the staff of His indignation. In the imminent future, God will use Germany as a rod to correct Israel for its rebellion against its Creator. For millennia, Israel has failed to be the righteous example Germany needed in order to turn to God. But the coming punishment that Israel faces will lead it to repentance and, in turn, modern-day Assyria will also repent. The book of Jonah shows that the capital of ancient Assyria, Nineveh, repented after hearing God’s warning message. This is the only time in history that a Gentile nation repented and turned to God! This too is a prophetic forerunner of the coming, lasting repentance of the German people. Despite the fact that in the imminent future Germany and the U.S. will face much conflict and devastation, a beautiful time of enduring cooperation lies ahead of them. Soon they will live “wunderbar together.” Many prophecies in the Bible point to the fact that after the establishment of God’s government on Earth, Assyria and Israel will never again be at war. Moreover, their God-led cooperation will lead the entire world into amazing prosperity. There is indeed a wonderful future ahead for these two nations and the rest of the world. Do these prophecies sound too wonderful to be true? Do they seem utterly impossible considering today’s hostilities and conflicts? Members of God’s true Church understand how these prophecies will become reality because the start of this prophesied unity is already seen in their congregations around the world. Soon, this unity will be reality for the entire world. Perhaps you’re wondering, When will all these wonderful prophecies come to pass? Are they millennia away, or could they be fulfilled in my lifetime? Understanding how close these events are is likely the most wonderful news that mankind could ever hear. The late Herbert W. Armstrong has written a small but powerful booklet that explains the cause of world evil and when and how God will solve mankind’s problems. Request your free copy of his booklet The Wonderful World Tomorrow—What It Will Be Like to learn about the great hope that lies ahead for this world. I also encourage you to read “A Nation Worth Applauding” to learn how Germany’s qualities today will be used for an exceedingly good purpose under God’s and Israel’s leadership in this prophesied World Tomorrow.